There is growing interest in LED signs because they are considered an eco-friendly alternative to neon signs, while being just as intriguing and effective, if not more so. Light Emitting Diode (LED) signage is mostly used in small to medium sized interior advertising. It is also used for large off-premise digital billboards that are intended for viewing from afar. LED signage is durable. LEDs do not contain a filament, so they don’t burn out. Two of the most important considerations when designing LED signage are the viewing distance and reading angle. The ideal viewing distance is the position where singular pixels start to merge together to create a smooth and seamless image. Signs for close viewing distances usually feature small gaps from one pixel to the other—10 – 12mm—while signs installed farther away from traffic or at a great height usually have greater spacing between the pixels, around 25mm. The LEDs used in indoor and outdoor signage emit directional light, such that the light emitted is brightest when placed in the viewer’s horizontal line of sight, and gradually dims as the viewer moves sideways. 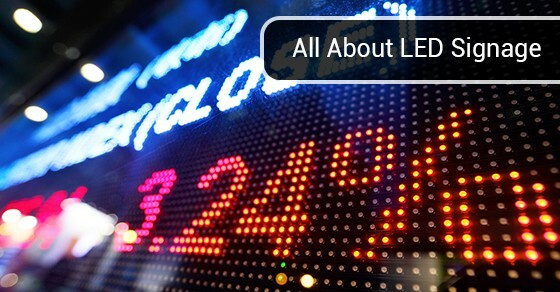 LED signage usually comes with an indicated viewing angle, which refers to the position at which the bulb’s brightness is half the value when viewed directly at the midpoint. So, for example, assuming the LEDs used have a 140-degree viewing angle horizontally, it means that the brightness is 50% of what it would be when viewed perpendicularly at 70 degrees left or right. The viewing angle is also indicated vertically, and is measured in a similar way, though most designs use sign louvres to minimize the amount of light spilling away from an observer. That said, the vertical viewing angle above and below the horizontal position is not symmetrical, because observers normally view the LED signage from below. Designers also take into consideration the reading angle, which is the position at which viewers can read the LED message. This value is usually higher compared to the viewing angle, though it depends on environmental parameters and the lighting circumstances of your sign. Lastly, it is important to note that the size of the LED display largely depends on its location and specific application. Other factors include content, sign elevation, speed of traffic, availability of stop lights or signs, and viewing distance, among others.